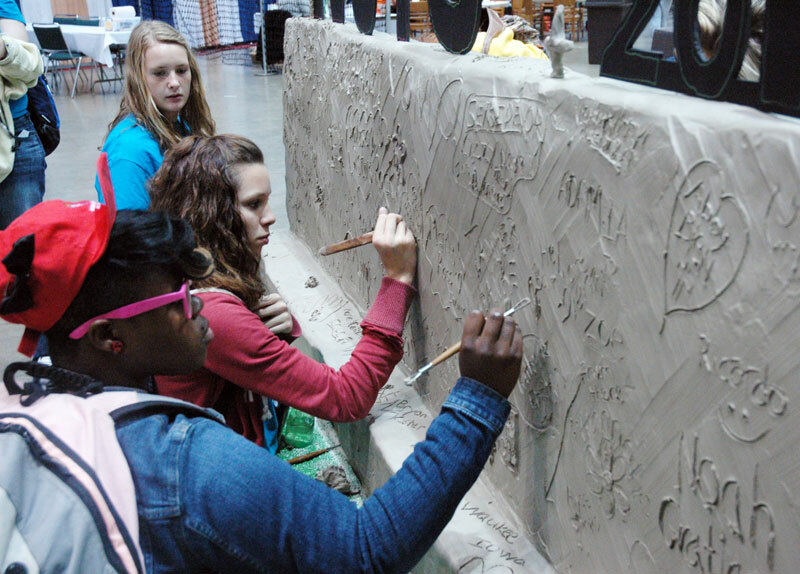 One of the most popular places during the National Catholic Youth Conference was Victory Park, a theme park inside the Indiana Convention Center in Indianapolis that featured everything from games and free gifts to college information and a coffee-house setting for music. 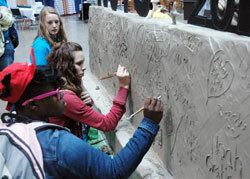 Here are glimpses of five of the most popular activities that teenagers enjoyed during the conference on Nov. 17-19. Posing with the pope—The opportunity to get a picture taken with Pope Benedict XVI was just too irresistible for many teenagers, including Brenden Popson and Sam Murphy of Our Lady of Perpetual Help Parish in New Albany. Leaving a mark—The Creative Corner was a section of Victory Park where many teenagers embraced the opportunity to paint a small canvas, sign a 9-foot-high graffiti wall, carve their names into a wall made of 2,000 pounds of clay, and dip their hands in paint so they could make an imprint on a 24-foot-tall canvas tree. Getting silly with the Salesians—Hoping to win a yo-yo, beach ball or flying disc, teenagers flocked to a carnival-like area staffed by Salesian sisters, brothers and priests. Prizes were earned for such achievements as bouncing a marble into a thimble, knocking down milk bottles with bean bags, throwing metal rings onto a bottle’s neck, and knocking over soda cans by shooting rubber bands. Being a kid—The fun continued in the play area of Victory Park where teenagers jumped in a moon bounce, competed in a human foosball game, jousted with large padded sticks, and raced through an inflated obstacle course.